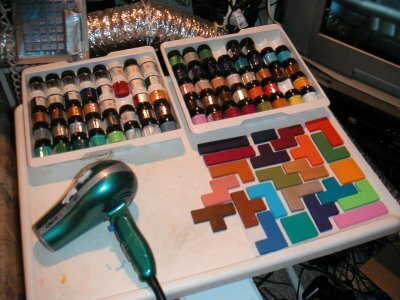 I've created a tetris jigsaw puzzle. It was fun to finally make use of a whole bunch of the colors in my paint set that I've never gotten to use before. Each of the pieces has a small number on it which indicates the order in which it fell. Piece 1 is the first piece that the player would have to put down at the bottom. Piece 2 is next, etc. The last piece is at the top and is only 2 squares. This is because the last piece is sticking off the top of the board. 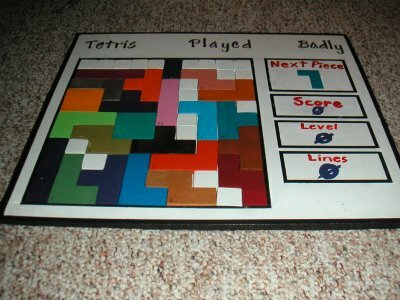 Also notice that the score, level, and lines are all 0 (which is why it's titled "Tetris Played Badly". All of the white squares are glued to the board so that the player can't put any pieces there. This is necessary because if the player were allowed to complete a row then the row would disappear and I'd have to cut out and paint more pieces!